15,491,975 Impressions. Yes, that's MILLIONOne of the challenges we have as people with rheumatoid arthritis and other types of chronic illnesses is the feeling of being invisible. Of not being part of a greater whole. Of wondering if our voices make a difference. The isolation makes coping so much harder. When we announced that Britt Johnson had become the new Social Ambassador for the HealthCentral RA site, we had big plans. The inaugural event was her takeover of the HealthCentral @Health_Tips for a 36-hour tweet-a-thon spreading awareness of what it’s like to live with chronic illness. We wanted to build on Britt’s own very successful #ChronicLife event this past February and hoped that by adding HealthCentral’s reach, we could create something even more magical. For a day and a half, Britt tweeted about how her chronic illnesses affect her life, supported by me and the RA team of writers. 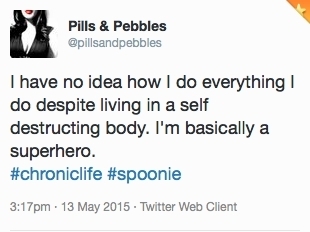 We included the hashtag #ChronicLife in every tweet and asked the community to do the same. The #ChronicLife event was more successful than we had dreamed in our wildest imaginings! We trended nationally for the first seven hours and then on and off again for the remainder of the event, reaching as high as the third most popular discussion on Twitter. Almost a thousand people participated, sharing the reality of living with chronic illness. The conversation ranged from the painful difficulties in getting through your day, sharing experiences, and supporting each other. By the evening of the first day, the conversation became more empowered, and we started talking about how to cope, and how we find a way to live as well as possible with our illness. Recently, I wrote a piece for my personal blog in which I talked about finding my tribe online. For most of my life until then, I had lived and coped with RA on my own, without knowing others like me. Finding people who know and share my reality has been incredibly meaningful. It feels like home. The #ChronicLife event multiplied that feeling by thousands. The people who actively participated, and the people who followed along without tweeting themselves, came together in a huge hug. We felt seen, we felt known, we felt safe. There was another aspect to this event, as well. By Britt taking over the @Health_Tips account, posting about her life and retweeting the contributions of the community, we accomplished two goals. We created awareness within the chronic illness community. And we shared our awareness messages with thousands of people who do not live with chronic illness. “Collectively we created a body of information that can help educate families and friends, medical students, doctors, and all health care professionals about the moments that are impacted throughout our day. These shared events can help various health care institutions and companies work smarter and better for us,” Britt said. We made change happen. Big change. As a community, we should be very proud of how we worked together to share the message. As we move out of Arthritis Awareness Month, we will continue our awareness and advocacy efforts by engaging with you here on the RA site and on social media. Follow the RA site writers and sign up for our newsletter to be notified of coming events. Pick a date and length of time to live-tweet, live-blog, live-Instagram, etc. your #ChronicLife. *Note: Participating can be both emotionally and physically tiring. Pick a length of time or occasion that suits you! A single doctor’s visit, an infusion, or a 12-hour day. The HealthCentral #ChronicLife Twitter rent lasted for 36 hours. Unless you connect with others to host as a group, I’d advise going to that long. A week later, I’m still recovering! Decide on your personal ground rules ahead of time. How much will you share? What will you share? Are there any subjects off limits? Announce your date and time, so that we can learn from your voice! Notify the Health Central RA Team, and we will share with our communities. Use the “#ChronicLife” hashtag on every tweet, post, message, etc. so it can be easily found. You can also participate without having a specific event. Include tweets about how your chronic illness affects your day-to-day life as you interact on social media. Don’t forget to include the hashtag #ChronicLife.